This article is co-authored by Jonah Pemstein and Sean Dolinar. For the introductory, less math-y post that explains more about what this project is, click here. To adapt this to baseball, the true “score” would be the true talent level we are seeking to find, and observed “score” is the actual production of a player. Unfortunately, the true talent level can’t be directly measured. There are several methods to estimate true talent by accounting for different factors. This is, to an extent, what projection systems try to do. For our purposes we are defining the true talent level as the actual talent level and not the value the player provides adjusted to park, competition, etc. The observed score is easy to measure, of course — it’s the recorded outcomes from the games the player in question has played. It’s the stat you see on our leaderboards. The error term contains everything that can affect cause a discrepancy between the true score and the observed score. It contains almost everything that affects the observed outcome in the stat: weather, pitcher, defenses, park factors, injuries, and so on. This analysis isn’t interested in accounting for those factors but rather measuring the noise those factors in aggregate impart to our observed stat. *Or at bats, or balls in play, depending on the stat we were trying to measure. So, for example, we would use PA for OBP, AB for AVG, and BIP for BABIP. Whenever we say “plate appearances” in this post, know that we mean PA/AB/BIP. *In Carleton’s most recent work on this, he used the Kuder-Richardson 21 formula, which is the mathematical equivalent of Cronbach’s alpha for binary data. This works fine for data that are binary, but we chose to use Cronbach’s alpha for everything for ease of not having to code for multiple formulas — not everything is binary. Where i represents each plate appearance 1 through K, t represents the Player Totals for each player 1 through N, and K is as defined above. This formula uses the ratio of the variance of each plate appearance among all players (si2) and inter-player variance (st2). The variance within the PA can be thought of as the noise within the particular stat. The inter-player variance is the variance of the Player Totals column in the example matrix. (It should be noted this variance term is the variance of the sum of the binomial outcomes for each player and not of the sum divided by K.) Subtracting this ratio from 1 yields the relationship for alpha: the ratio of true variance to the observed stat variance. 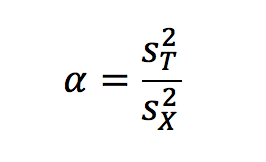 This formula is helpful in understanding what factors affect the alpha measurement. High variance within the plate appearances and low variance between the players will lead to a low reliability. Since the plate appearances are being treated equally, the variances within will generally be the same for every PA column. But the inter-player variance, on the other hand, changes greatly depending on the stat we are measuring; since more variation among players means a larger alpha, stats such as strikeout percentage (K%) — for which there is a lot of variation in the population of players — will have a higher reliability coefficient than stats such as HBP% (hit by pitch per plate appearance), where the variation is much lower. 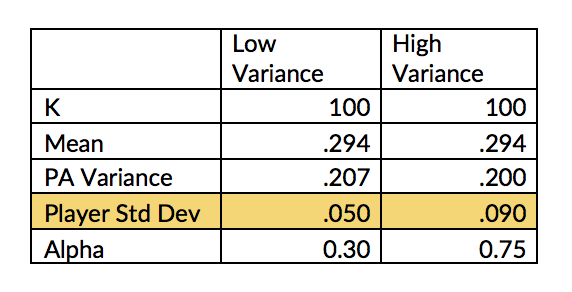 The impact of sample variance is best demonstrated by two example data sets. Both were created using a normal distribution of player talent levels centered around a league average of .300, and then a random binomial generator was used to simulate 100 plate appearances. The only parameter that was varied was the standard deviation of the the normal distribution for the player talent levels. The lower variance group were more tightly concentrated around .300, while the high variance group have much more spread. While the variance within PAs remained more or less the same, the variance among players had a pronounced effect on alpha. To get our PA matrices for each number of plate appearances (K), we selected a random sample of K plate appearances from each player-season from 2009-2014 with at least K plate appearances. This allows for inclusion of the most players. As K grew, the number of players (N) in the matrix naturally decreased significantly, but this is also representative of the selection bias that occurs during the season as better players get more PAs. Since both the reliability coefficient and the confidence bands are dependent on the sample, it’s important to view any analysis within the context of the parameters of each reliability measurement. 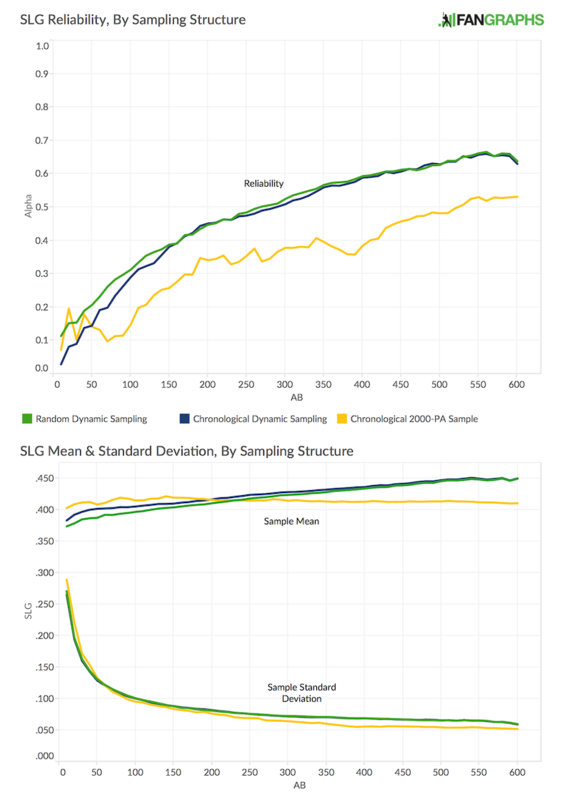 We tested a few different sampling approaches: Carleton’s original 2000-PA/2000-AB/1000-BIP sampling structure, our K-PA dynamic sampling data set, and our technique using chronological selection of the PA as opposed to randomizing them. While we noticed some differences, most of the empirical findings are fairly similar. The reliabilities’ relative positions to each other remain rather consistent. The greatest discrepancy we found between different sampling structures was with SLG and ISO, where Carleton’s sampling structure produced lower alpha measures, mostly due to lower inter-player variances. The graphic above shows on the more dramatic examples of the discrepancy of between different sampling structures. The inter-player variance is lower in Carleton’s 2000-AB (yellow) sampling structure than it is using the K-PA dynamic sampling approach (green and blue). The sample mean also doesn’t change for the 2000-AB, while the dynamic sampling structure’s sample mean gradually rises. Chronological sampling also reduced the reliability for low numbers of PA because grouping the first PA/AB/BIP in the data set together group many players’ early plate appearances together. Since player talent does vary with age and experience, this most likely contributes to the slightly reduction in reliability. Finally, the time frame impacts the reliability, because of the dynamic nature of baseball. The run environment has dramatically changed since 2002. Having stats from a high-run environment mixed with stats from a low-run environment creates an inflated inter-player variance. As mentioned in the introductory post for this project, this reveals that reliability measurements should be done on samples which are specific to the application. We will fully investigate this concept further in a future post and attempt to refine a sampling structure. The equation is similar to the one outlined by Tango, Litchman & Dolphin , except alpha is replaced. In fact, alpha and Tango’s equation have the same basic inputs: variance of the stat and the inter-player variance. In other words, the inter-player variance has a large effect on regression towards the mean using Tango’s formula. This is the same conclusion we drew from before about inter-player variance’s effect on alpha. One other difference in our formulation of regression toward the mean is that Tango’s formula uses the league average while we use the sample average. The sample mean refers to the mean of players with K plate appearances, since each reliability coefficient is measured in the context of the players in that sample. With a static sampling structure, the inter-player variance shrinks as more plate appearances are added. We used a dynamic sampling structure, so both the mean and variance change as K grows larger and the size of the player pool shrinks. The confidence band is constructed by adding and subtracting the SEM multiplied by the appropriate z-score to the regressed stat. This creates a confidence interval around the regressed stat and not the observed stat. For extreme values, the confidence interval might not contain the observed stat. While the intention of this project wasn’t to find something groundbreaking, we did discover more subtle findings which affect the reliability measurement. As already mentioned, it’s not really possible achieve a universal sampling structure, because reliability is dependent on what you are comparing. One of the extensions of the issue with sampling is choosing an appropriate time frame. Using more data in this case doesn’t always make alpha more accurate. Including the high-run environment of the early 2000s with the low-run environment of the 2010s creates more inter-player variance, which will artificially inflate the reliability numbers, and mixes in data from a different run environment, which we do not want. The findings of this project are by no means a panacea for determining when particular stats are good to use, but we think they certainly help a lot and we hope that they will steer research on this topic in the direction of confidence bands and uncertainty measurements instead of fixed stabilization points. We acknowledge that there are several other approaches that could be used. Even within the reliability-regress to the mean framework, the sampling structure can always be improved and adjustments could be made to correct for park factors, run environment, and league. K — number of items (PA, AB, BIP). N — number of subjects (players). PA/AB/BIP — plate appearances, at bats, and balls in play, the items in a reliability sample. Depending on the denominator of the stat, the PA, AB, and BIP will change. We said simply “plate appearances” many times throughout this post to refer to all of PA, AB, and BIP. Alpha — Cronbach’s alpha. We are using it for the reliability measurement (or coefficient). Alpha can be interpreted as the proportion of true variance to observed variance. Observed Stat — the stat found on our leaderboards. What the player actually did. Regressed Stat — the stat that has been regressed to the mean using the reliability coefficient. Within-plate appearance variance — the variance within a column. The variance of each column is taken then the variances are summed together. 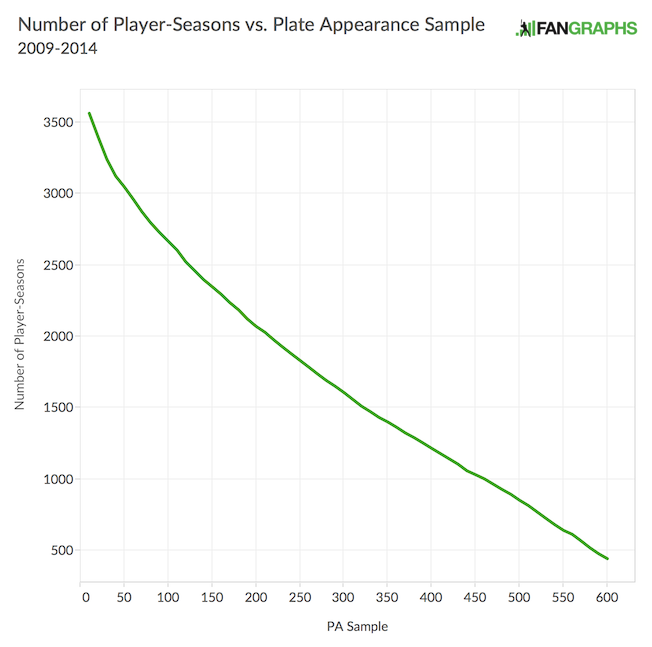 Random Dynamic Sampling — uses a dynamic sampling draw for all player-seasons with at least K plate appearances, and randomly selects plate appearances from that player-season to be included in the PA matrix. Chronological Dynamic Sampling — uses dynamic sampling but it draws the player’s first, second, third, etc. PA/AB/BIP in the data set to put into the matrix. Sample mean — the average value of a stat for the player contained within a reliability measurement sample. Sample standard deviation/variance — the standard deviation or variance of the players stats within a reliability measurement sample. Cronbach, Lee J. (September, 1951). Coefficient alpha and the internal structure of tests. Psyschometrika. Vol 16, No: 3. Tango, T., Lichtman, M., & Dolphin, A. (2007). The book: Playing the percentages in baseball. Dulles, VA: Potomac Books, Inc.
Weir, Joseph P. (Feb 1, 2005). Quantifying test-retest reliability using the intraclass correlation coefficient and the SEM. Journal of Strength and Conditioning Research, 19(1), 231-240. Carleton, Russell A. (July 16, 2012). Baseball therapy: It’s a small sample size after all. Baseball Prospectus. Retrieved from http://www.baseballprospectus.com/article.php?articleid=17659. Carleton, Russell A. (May 9, 2013). Baseball therapy: Should i worry about my favorite pitcher?. Baseball Prospectus. Retrieved from http://www.baseballprospectus.com/article.php?articleid=20516. Carty, Derek. (June 20, 2011). Resident fantasy genius: When pitchers’ stats stabilize. Baseball Prospectus. Retrieved from http://www.baseballprospectus.com/article.php?articleid=14293. Carty, Derek. (June 13, 2011). Resident fantasy genius: When hitters’ stats stabilize. Baseball Prospectus. Retrieved from http://www.baseballprospectus.com/a/14215. We hoped you liked reading A New Way to Look at Sample Size: Math Supplement by Sean Dolinar! The use of Alpha is predicated on the items (PA/AB/IP, in this case) being homogenous, or unidimensional. Given your sampling procedure, this might be a safe assumption. To the extent that this assumption is violated, however, Alpha will yield a biased estimate of reliability. Perhaps it would be better to use a reliability index that doesn’t rely on that assumption, such as McDonald’s Omega_t (if you’re interested in explaining total test variance) or Omega_h (if you’re interested only in the proportion of variance attributable to a general factor). See McDonald (1978; 1999) for a presentation of these two indices, respectively. Also see Cortina (1993), Sijtsma (2009) for an overview of the severe limitations of Alpha as a measure of reliability and Revelle & Zinbarg (2009) for an overview of alternatives. Would using factor-based reliability analysis require us to qualify the PA as different from each other. Like LHP/RHP or 95+ MPH, or even individual pitcher, etc? Those are some of the thoughts that come to my head as far as factors that could be present. These are all valid concerns. I have some research in progress (though on the back, back, back burner) that looks at using some IRT-based approaches to estimating true hitter ability (contact via batting average, in this case) conditional on the individual pitcher(s) faced. I’ve seen other work recently (Hardball Times, maybe?) that used multilevel regression to accomplish something similar, though I prefer the SEM/IRT framework to MLM. I think a necessary step is to at least conduct some cursory dimensionality analyses with your different sampling methods to determine whether these samples yield conditionally independent sets of PA/AB/IP. If the data are, in fact unidimensional then Alpha and Omega_h would be equivalent measures. If they are not unidimensional, then Alpha would be an inappropriate measure of reliability. Luckily, there are other indices, such as those I mentioned that are suited to handle data with potentially spurious specific factors. It’s possible, though unlikely that there could be some clear delineation between PAs based on LHP/RHP, as an example. If this is the case, then perhaps a single reliability coefficient would not be appropriate.